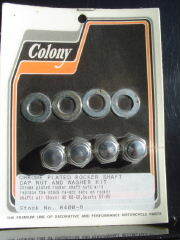 Chrome cap style end nuts and washers will replace the “Red Dot” rocker shaft nuts. Fits all Shovelheads 1966 - 1984. Fits all Ironhead Sportsters 1957 - 1985. Replaces OEM #'s 7872, 7875 and 6466W.